Neighborhoods mean different things in varied contexts like computational geometry, administration and planning, as well as urban geography and other fields. Among the multiple contexts, computational geometry takes the most abstract and data-oriented approach: polygon neighborhoods refer to polygons sharing a boundary or a point, and point neighborhoods are defined by connected Thiessen polygons or other more complicated algorithms. Neighborhoods in some regions can be a practical and clearly delineated administration or planning units. In urban geography and some related social sciences, the terms neighborhood and community have been used interchangeably on many occasions, and neighborhoods can be a fuzzy and general concept with no clear boundaries such that they cannot be easily or consensually defined. Neighborhood effects have a series of unique meanings and several delineation methods are commonly used to define social and environmental effects in health applications. This entry was published on March 26, 2019. Neighborhood: The term neighborhood does not have a consensus definition and has been used in multiple contexts ranging from a term in computational geometry to an administration unit in planning and related applications and a variety of meanings in urban geography and other social sciences. The terms neighborhood and community have been used interchangeably in many occasions. In the following sections, neighborhood will be defined and discussed in three specific contexts at various abstraction levels. It is important to emphasize that "neighborhood" is a broad and complex concept with multi-faceted and multi-scale meanings and definitions. 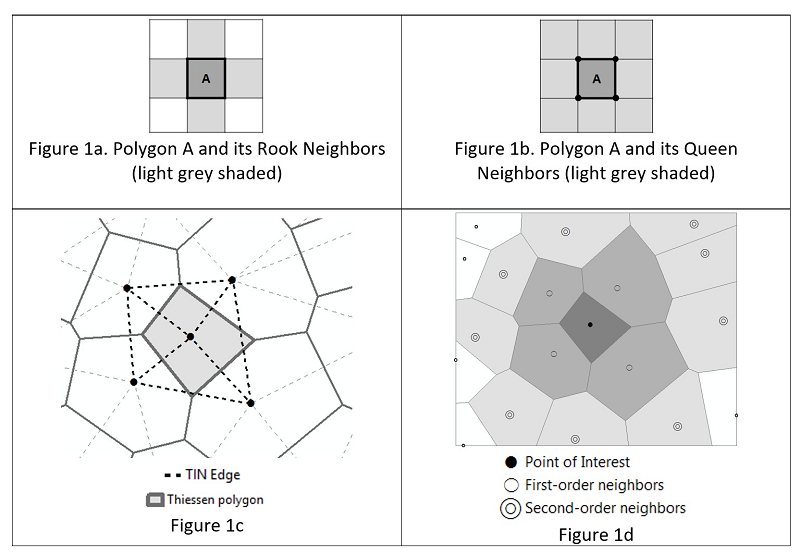 This entry focuses on introducing the neighborhood concept from the perspective of computational geometry, or the topological relationships connecting geographic data in the form of points, lines and polygons (Section 1). Subsequent sections consider the role of the concept in administration and planning on the one hand and urban geography on the other hand (Sections 2 & 3). However, additional discussion is needed if the goal of introducing neighborhoods shifts to other perspectives. Empty Circle Criterion: Triangulate three points, if the circumcircle of the triangle contains no other points than the three nodes, the triangle satisfies the empty circle criterion. Delaunay Triangulation: Triangulate a finite set of points, if all the triangles satisfy the empty circle criterion, we call this triangulation a Delaunay triangulation. Dual Graph: The dual graph of a planar graph with tessellated polygons is formed by taking the center of each polygon as a vertex and joining the centers of adjacent polygons. Neighborhood definitions in computational geometry are the most abstract and refer to topological adjacency. The concept has been widely used in GIS and specifically in spatial interpolation methods to find the nearest neighbor(s). In a 2D space, polygon neighbors, borrowing names from chess, mean two polygons share either a line segment – Rook Neighbors (Figure 1a), or just a point – Queen Neighbors (Figure 1b). For points, being dimension-less and size-less, the neighbors are usually defined with the construction of Thiessen polygons (or Voronoi diagrams in mathematics or computer science). Thiessen polygons, named after American meteorologist Alfred Thiessen, delineate a region that is closer to a given weather station (generator point) than to any other points. Therefore, Thiessen polygons are sometimes referred to as dominant regions for points. For a set of points, Thiessen polygons can be constructed in many ways, and a popular and straightforward algorithm is to first create a triangulated irregular network (TIN) using Delaunay Triangulation, following the Empty Circle Criterion, and then build Thiessen Polygons as the Dual Graph of the TIN. To implement this method, perpendicular bisecting lines (solid lines on Figure 1c) of the TIN edges of the point set (dotted lines on Figure 1c) are constructed. The polygons delineated by the trimmed intersection of all those perpendicular bisecting lines are Thiessen polygons. If two Thiessen polygons share a boundary, the two generator points of those polygons are defined as neighbors, or first-order neighbors (Figure 1d). Second-order neighbors of a point are its neighbors’ neighbors (Figure 1d). This method is used in many GIS programs because the TIN model is an essential model for representing surfaces. Figure 1. Typical Neighborhood Definition for Polygons and Points. Source: authors. The above neighbor definitions are based on the assumption that only the locations of the points matter. Many geographic problems need to count for both location and capacity (weight), and in these situations, weighted Thiessen polygons will be a better choice than normal Thiessen polygons. However, a point’s neighbors could be changed in normal versus weighted scenarios. In Figure 2, normal Thiessen polygons are solid lines (left) and weighted Thiessen polygons are dotted lines (right). P1 & P2, P1 and P3, and P1 and P4 are neighbors in normal Thiessen but are not in weighted Thiessen. In addition to weighted Thiessen, there are many other algorithms to define all kinds of neighbors in computational geometry, such as algorithms based on nearest neighbor graphs (NNGs), relative neighbor graphs (RNGs), minimum spanning trees (MSTs), Gabriel graphs (GGs) and more advanced and complex continuous definition such as β-skeleton defined neighbors (Radke, 1988). Figure 2. Normal (left) and Weighted (right) Thiessen Polygons, Pn(weight). Source: authors. For raster data, neighbors of a raster cell or a group of cells are defined by a fixed or variable number of cells. Map algebra operations can help describe raster neighborhoods at all levels such as local, focal, zonal and global. In Figure 3, dark grey represents the raster cell of interest, and its neighbors are in light grey. Local means the cell itself. The focal neighborhood delineates the cell and its immediate surrounding area. The zonal neighborhood shows a zone around the cell, and the zone boundary could be rule-based (based on species, density and more) or arbitrary (such as administration zones). Global simply includes everything in the study area. Figure 3. Neighborhoods for Raster Operations. Source: authors. In the United States, geographic units are usually referred to as those defined by the U.S. Census Bureau such as block, block group, and tract. "Neighborhood" is not a standard geographic unit in that sense. However, in some urban areas, a neighborhood is an administrative or planning unit. For example, in Atlanta, Georgia, there are 25 neighborhood planning units (NPUs), and 244 neighborhoods within these NPUs (Figure 4). There are approximately 2,000 people in each Atlanta neighborhood. Neighborhood is not a geographic unit adopted by the U.S. Census Bureau to conduct population surveys, where the hierarchical units of state, county, tract, block group, and block are used. Although the delineations of neighborhoods match block boundaries most of the time, they are not necessarily 100% aligned with blocks, block groups or tracts. Given that there are 134 census tracts and 325 block groups within the Atlanta city limit, the average size of a neighborhood is between a block group and a census tract, about 1.3 block groups. Figure 4. 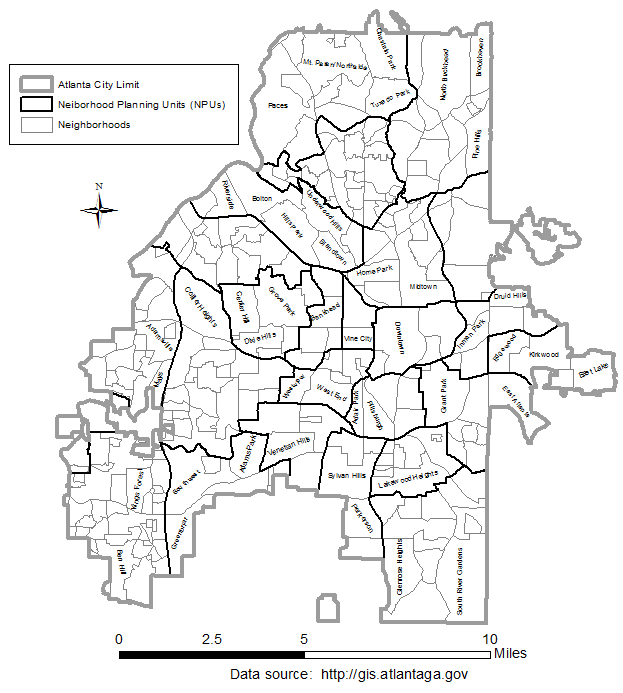 Neighborhoods in the City of Atlanta. Source: authors. Take another example, in China, where neighborhood/community or village is the lowest level of the five administration divisions (Table 1). For example, the City of Beijing (the national capital and equivalent to a province-level division) has 16 districts, 181 townships and 150 subdistricts (a total of 331 at this level), and 3,941 villages and 3,054 neighborhoods (a total of 6,995 at this level). There are approximately 3,000 people in each neighborhood or village (Beijing Municipal Civil Affairs Bureau, 2017). Neighborhood leaders are government officials and are responsible for the administration and management of their units, and report to their upper-level subdistricts or townships. From the perspective of urban geography, sociology, and other related social sciences, a neighborhood carries the fundamental idea of a place where people live and interact with one another and tends to have its own identity based on income, education, ethnicity and other socio-economic characteristics (Rutledge et al., 2011). Neighborhoods usually have fuzzy and sometimes multiple geographic boundaries, and their spatial delineation is closer to functional or perceptual regions than formal regions. These neighborhoods, especially the ethnicity-based ones such as Little Italy, Chinatown, Little Saigon, and Little Mogadishu, can be viewed as cultural clusters. There are alternative views of neighborhoods to those that are ethnicity- and class-based. Using social-movement theory, Martin (2003) explained how “neighborhood organizations foster a neighborhood identity that obscures social differences, such as ethnicity and class, among residents.” She described such a process as “place-framing,” and explained how organizations are motivated to unite residents for a neighborhood-oriented agenda, and how place informs activism. The impact of place is also emphasized in a landmark research project in Chicago by Sampson (2012) which advocates that communities still matter because “life is decisively shaped by where you live”, despite the dominating contemporary views of society claiming that community is dead, and we either act solely as individuals or are overwhelmingly controlled by global forces. Neighborhoods are mentioned more often in big cities, although suburban or rural areas also have neighborhoods. In many scenarios, these neighborhoods or communities, do not have clear boundaries, but often fuzzily delineated by factors or processes such as race and civic life (Oliver, 2010), social networks (Hipp, Faris, & Boessen, 2012), housing (Kauko & d’Amato, 2012), social conditions (Looker, 2015), population (D. Martin, 1998) and all kinds of contextual variables (Kwan, 2012). Similar views include ones in which neighborhoods have become sites of consumption and spaces to be consumed, and that interactions and power played by a diverse collection of people and institutions are the underlying dynamics to ultimately shape and reshape the neighborhoods (Betancur & Smith, 2016). Neighborhoods also serve as the observational and operational scale for reforming urban policies on immigration, school closing and economic mobility (Pagano, 2015). In addition to urban studies, the concepts of neighborhood and neighborhood effect are used extensively in studying human health and illness outcomes such as estimating environmental exposures, the effects of the built environment, and social determinants of health (Chaix, Merlo, Evans, Leal, & Havard, 2009; Flowerdew, Manley, & Sabel, 2008; Strominger, Anthopolos, & Miranda, 2016). When working within health context, neighborhoods can mean either census units – many health data are collected and compiled in block groups, tracts or ZIP codes, or geometric units such as buffers around point, line or polygon features, or process-generated shapes such as chemically contaminated areas. To fill in the gaps in the health literature, Matthews (2011), Robertson and Feick (2018) and many others have written extensively about the theoretical and practical considerations connected with the choice of neighborhood definition, and summarized manual and automatic approaches to defining neighborhood boundaries in those studies. Neighborhood is a significant concept in geographic information science and a variety of related fields. Its meanings vary in different settings, ranging from very abstract topological relationships among spatial objects, social clusters in cities, and areas of interest in health studies. No matter what specific domain it is in, ultimately, the common key point is that neighborhood is about relationships between the focused location or object to its surroundings. The relationships can be static or dynamic, emphasizing either the form or the process of the geographic phenomena being studied. Neighborhoods should be considered with other critical geographic concepts such as scale and aggregation, and spatial versus context. Related theories and concepts include those connected with space and place (Tuan, 1977), the Modifiable Area Unit Problems (Openshaw, 1984), the Uncertain Geographic Context Problem (UGCoP) (Kwan, 2012), and the Uncertain Point Observation Problem (UPOP) (Robertson & Feick, 2018). Kauko, T., & d’Amato, M. (2012). Neighbourhood Effects A2 - Smith, Susan J. In International Encyclopedia of Housing and Home (pp. 50-54). San Diego: Elsevier. Looker, B. (2015). A nation of neighborhoods : imagining cities, communities, and democracy in postwar America: Chicago: The University of Chicago Press. Matthews, S. A. (2011). Spatial Polygamy and the Heterogeneity of Place: Studying People and Place via Egocentric Methods. In L. Burton, S. Matthews, M. Leung, S. Kemp, & D. Takeuchi (Eds. ), Communities, Neighborhoods, and Health. Social Disparities in Health and Health Care (Vol. 1, pp. 35-55). New York, NY: Springer. Oliver, J. E. (2010). The paradoxes of integration: race, neighborhood, and civic life in multiethnic America: Chicago; London: University of Chicago Press. Openshaw, S. (1984). Ecological Fallacies and the Analysis of Areal Census Data. Environment and Planning A, 16, 17-31. Pagano, M. A. (2015). The return of the neighborhood as an urban strategy: Urbana : Published for the College of Urban Planning and Public Affairs (CUPPA), University of Illinois at Chicago, by the University of Illinois Press. Radke, J. D. (1988). On the Shape of a Set of Points. In G. T. TOUSSAINT (Ed. ), Computational Morphology, in the series of Machine Intelligence and Pattern Recognition (Vol. 6, pp. 105-136). North-Holland: Elsevier Science Publishers B.V.
Rutledge, K., McDaniel, M., Boudreau, D., Ramroop, T., Teng, S., Sprout, E., . . . Hunt, J. (2011). Neighborhoods. In K. West & J. Evers (Eds. ), National Geographic Encyclopedia: National Geographic Society. Sampson, R. J. (2012). Great American City: Chicago and the Enduring Neighborhood Effect: University of Chicago Press. Tuan, Y.-f. (1977). Space and place : the perspective of experience. Minneapolis: University of Minnesota Press. Describe the complexity and uncertainty in neighborhood definition, incorporating the idea of no consensus definition to fit all contexts. Explain the three typical neighborhood definitions in the context of computational geometry, administration and planning, and urban geography. Within the context of computational geometry, provide key neighborhood concepts for vector (point and polygon) and raster data using the most commonly used methods such as Rook Neighbors, Queen Neighbors, Thiessen polygons, Delaunay triangulations, and local, focal, zonal and global functions. Within the context of urban geography, explain neighborhood and community as social clusters. Within the context of health research, explain the needs, considerations, and use of neighborhoods to characterize social and environmental determinants of health. What are Rook Neighbors and Queen Neighbors for polygons? What are Thiessen Polygons and Delaunay Triangulations? How can one use them to define neighbors for a set of points? What are first-order and second-order neighbors? List a couple of variations of point neighborhoods using methods other than the basic Thiessen polygons. Could neighborhood be a real and tangible administration unit? Please list some examples. Are neighborhoods and communities the same? How can neighborhoods be defined in an urban setting? Please name a couple of neighborhoods in the U.S. that are defined in this urban geography context. What does neighborhood effect mean in health research?